Peanut butter, like most nut butters, is high in healthy unsaturated fats. Of the 16 grams of fat in a 2-tablespoon serving of smooth, salted peanut butter, only 3.4 grams come from saturated fat. In addition, peanut butter is cholesterol-free. Peanut butter also contains a significant amount of protein, minerals and some vitamins. Two tablespoons of smooth peanut butter contain 188 calories. Very few of the calories in peanut butter come from carbohydrates, as there are only 6.3 grams per serving. One serving of peanut butter contains 3 grams of sugar as well, nearly all of which is sucrose. One serving of peanut butter contains only 1.9 gram of fiber, which is about 8 percent of the 25 grams of fiber women need each day. A 2-tablespoon serving of smooth peanut butter contains 8 grams of protein. This is 17 percent of 46 grams of protein women need each day. Like most plant foods, peanut butter is not a complete protein because it lacks some of the essential amino acids. However, peanut butter can be put on whole wheat bread to make a complete protein. One serving of peanut butter contains 16.1 grams of fat, which accounts for 145 of the calories in each serving. Fortunately, most of the fat in peanut butter is from unsaturated fat, which can help to lower your bad cholesterol level. Peanut butter also contains 33 grams of phytosterols, which can help lower cholesterol, as well, by blocking its absorption into the intestines. Peanut butter provides moderate amounts of a variety of minerals. One serving supplies 26 percent of the DRI for manganese for women. One serving also supplies 16 percent of the DRI for phosphorus, a nutrient that's crucial for strong bones, as well as 17 percent for copper. Peanut butter also supplies more than 10 percent of the potassium and magnesium women need each day. Salted peanut butter contains 147 milligrams of sodium per serving, which is 6 percent of the maximum recommended daily allowance of 2,300 milligrams. Unsalted peanut butter contains only 5 milligrams per serving, making it a better choice if you're following a reduced-sodium diet. Peanut butter contains no vitamin C and only small amounts of many of the other water-soluble vitamins. 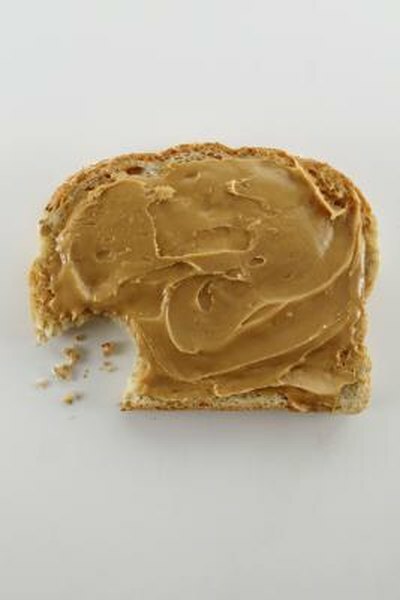 One serving of peanut butter only supplies more than 10 percent of the DRI for two B vitamins -- niacin and vitamin B-6. Both of these nutrients help you make energy. One serving provides more than 25 percent of the DRI for niacin and 13 percent for vitamin B-6. Peanut butter also contains very few fat-soluble vitamins. One serving supplies no vitamin D or vitamin A and less than 1 percent of the DRI for vitamin K, a nutrient that aids in blood clotting. Two tablespoons of peanut butter do, however, contain 2.9 milligrams of vitamin E, which is 19 percent of the 15 milligrams women should aim to consume each day.